Found this on the way home from work today. Wasn't there this morning. It appears to have been run over with extreme prejudice. It was at the end of a short bridge so I'm not sure if it was killed near the pond below and tossed onto the bridge, or was wandering when it happened to get hit. I'm thinking Nerodia rhombifer, but then again Agkistrodon piscivorus isn't out of the question--I've seen similarly-patterned piscivorus a few miles west of here. It was in the middle of the lane on a fairly busy road so I couldn't poke around too long. If it is a busy enough road and a bridge (which prevents swerving), it may have been accidentally hit and then hit many, many more times throughout the day. I've seen similar type things here in Florida. One particularly gruesome scene was a large pregnant cooter that was hit on a bridge, sending parts of her and her many eggs in all directions. I think most people would try to avoid hitting a turtle that large, but couldn't avoid it given the circumstances. Bridges are tough because animals can't escape the sides and people can't pull onto the shoulder to avoid something and they're certainly not going to pull into oncoming traffic. As far as the ID of the animal, it doesn't look like any of the cottonmouths I've seen. I believe you're correct in that this is a Nerodia rhombifer. 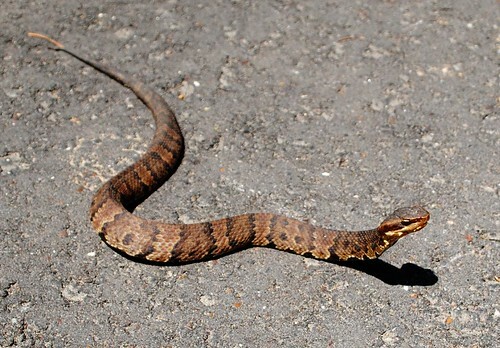 captainjack0000 wrote: As far as the ID of the animal, it doesn't look like any of the cottonmouths I've seen. I've seen a handful of LARGE cottonmouths around here that looked like that. With the preponderance of the DOR's dorsum obliterated, the lateral pattern had me second-guessing and thinking it could potentially be a piscivorus. Nevertheless, I labeled this animal as N. rhombifer. Your DOR doesn't look the same as the young cotton you posted. I can't say why, it just doesn't. I see cottonmouths pretty frequently down here, often like the one you posted. I think I've gotten pretty good at IDing them when they're nothing more than a smear. I'm not familiar with the water snake species you mentioned, but since it doesn't seem to be a cotton, I'd stick with your original hunch.